Placed in charge of Kala Bhavan's photographic studio by a sympathetic professor, Phalke soon imbibed the elements of photography and bought his first still camera in 1890. He then made full use of his photographic background to study the printing profession. Almost simultaneously he learned magic and took part in stage performances. He worked briefly with the Government of India's Archaeological Department but quit when he had saved enough money to start his own printing business. He prospered but his headstrong nature did not endear him to his partners and hence the quarrels which led to his search for a new profession. It was as if his entire life to date had been a mere preparation for what he was to do later in life. The only snag, however, was that of securing finance for his venture. Ironically, however successful he became in later years this would always be his perennial bane, thanks to his committed and stubborn nature. None of his many friends were willing to advance him the money required for his venture. In fact, many of them thought that the venture was a foolhardy one and hence doomed for failure. Some even thought of having him committed to an asylum. The only exception was Yeshwant Nadkarni, a long-standing friend who was convinced of his sincerity and honesty. However, even he needed proof that Dadasaheb could produce a story-film. Hence, it was not enough for Dadasaheb to produce a "topical" short. He had to make a short film centred around a theme if he had to prove his worth. Phalke planted a pea in an earthenware pot and began to record its growth one frame at a time with his simple five-pound movie camera, imported from London. It took him a full 45 days to shoot the 200-foot film which ran for a bare two minutes. A show of the film was held at an electrical shop in Kalbadevi for an amazed audience which saw the pea grow into a plant within a matter of minutes. Among those in the audience was Yeshwant Nadkarni who immediately agreed to finance Phalke's venture. Variously recorded in film history as The Growth Of Pea Plant and From Peanut to Plant, this short film was the first to use time lapse techniques in India. Thus, even if by accident rather than design, Phalke had made the first Indian documentary in the true sense of the word. Having proved his credentials and secured the finance required for the venture  meagre though it was  Dadasaheb set sail for London on February 1, 1912 in order to buy equipment and study the conditions of filmmaking prevailing there. Going abroad was not really a new experience for this ex-printer for he had studied the niceties of lithography in Germany. As such he was familiar with the terrain and what to expect. Arriving in London many weeks later he set about shopping for cine equipment with the help of the addresses given in the catalogues which he had studied so assiduously in India. However, the claims of the competitors so confused him that he realised he would need help in the matter. It was then that he saw a signboard for the 'Bioscope' cine weekly near Picadilly Circus and promptly registered himself as a subscriber. In this new role he went to meet the Editor, named Cabourne and immediately struck up a friendship with him. At first, Cabourne dissuaded him from the venture pointing out that many in England had not made a success of film production. 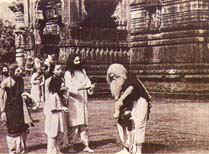 Eventually, however, when he saw that the middle-aged Indian was determined to go ahead, he helped him to not only buy the best available camera, printing machine, perforator and raw stock but even introduced him to a film producer named Cecil Hepworth who gave Phalke what is probably the shortest course in filmmaking.